The purpose of the Chickadee Nest is to give you a place to have some peace. By sharing home management, educational ideas, recipes and encouragement, personal stories, bargains, and more, I hope to help inspire and equip you to be intentional in life — to find the peace at home we are all striving for. There are a number of costs associated with running a blog — hosting, tech costs, design and development costs, etc. So sometimes when you click on a link, I will earn a small fee from that organization or company. I do accept paid advertising on my blog’s sidebar and use affiliate links in posts when they are available. In addition, I accept opportunities to write posts, share special offers, run giveaways, or write posts where I work directly with a company and they are underwriting the costs involved. However, I only accept this type of opportunity when it is something that fits with our mission and will be worth your valuable time. My readers are always my first priority. The views and opinions expressed on this blog are solely mine and I will do my best to always be honest and forthright in what I share and post here. In addition, occasionally, I am asked to give my opinion of a particular product or curriculum. Although I sometimes might receive monetary and/or product compensation for my reviews, the opinions that I write are exclusively my own and will not be swayed by any monetary or other compensation. If you ever have questions or concerns, please let me know via the Contact link at the top of this page. As much as I’d like to, I know I can’t please everyone, but I will always welcome your input and constructive criticism. Please note that all content and photo images of this blog are protected under all applicable international, federal, state, and local copyright laws. All rights reserved to the Chickadee Nest. You have my written permission to repost excerpts of blog posts elsewhere as long as the Chickadee Nest is cited within your post and a link is created to redirect your readers back to theChickadeeNest.com. 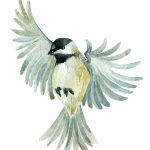 When accessing the Chickadee Nest, we may learn certain information about you, both automatically and through voluntary actions you may take during your visit. This policy applies to information we collect on the website and in email, text, or other electronic messages between you and the Chickadee Nest. The Chickadee Nest is not intended for children under 13 years of age. No one under age 13 may provide any information to or on the Website. We do not knowingly collect personal information from children under 13. If you are under 13, do not use or provide any information on this Website or on or through any of its features/register on the Website, make any purchases through the Website, use any of the interactive or public comment features of this Website or provide any information about yourself to us, including your name, address, telephone number, email address, or any screen name or user name you may use. When you access this website, we may learn certain information about you during your visit. Similar to other websites, the Chickadee Nest utilizes a standard technology called “cookies” and server logs to collect information about how our site is used. Information gathered through cookies and server logs may include the date and time of visits, the pages viewed, time spent at our site, and the websites visited just before and just after our own, as well as your IP address. We are committed to keeping your e-mail address confidential. We do not sell, rent, or lease our subscription lists to third parties, and will never disclose your email address to any third parties. If you reside outside of the European Union and opt to receive any free resources or purchase any products sold on this website, we will automatically enroll you to receive our free email newsletter. If you do not wish to receive this newsletter, you can unsubscribe at any time. We include an “unsubscribe” link at the bottom of every email we send. If you ever have trouble unsubscribing, you can contact us to unsubscribe from future emails. If you are in the European Union and opt to receive any free resources or purchase any products sold on this website, we will only enroll you to receive our free email newsletter if you affirmatively consent to it. If you do not wish to receive this newsletter, you can unsubscribe at any time. We include an “unsubscribe” link at the bottom of every email we send. If you ever have trouble unsubscribing, you can contact us to unsubscribe from future emails. We use personal information for purposes of presenting our Website and its contents to you, providing you with information, providing you with offers for products and services, providing you with information about your subscriptions and products, carrying out any contract between you and the Chickadee Nest, providing customer service, and making available other items and services to our customers and prospective customers.